Amazingly beautifully Colorful Scenes Captured on a Voyage Around the World – Sig Nordal, Jr.
December 25, 2017 December 26, 2017 Sig Nordal, Jr.
British travel photographer Jordan Hammond may only be in his early twenties, but he’s already well on his way toward leaving his mark in the industry. His gorgeous photographs spark an immediate wanderlust in viewers, as they follow along on his journey around the world. With a special emphasis on Asia, his bright, vibrant images are instantly recognizable. Shockingly, Hammond is relatively new to photography, his creative passion ignited while living and working in China a few years ago. A scroll through his highly followed Instagram will have you jetting from Chiang Mai to Abu Dhabi in an instant, each location captured in vivid detail. In fact, if you are a fan of his candy-coated colors, you can even purchase his set of Lightroom Filters. Most recently, he and his partner—a frequent subject in his imagery—spent a month traveling through Europe. From the Swiss Alps to Germany’s national parks, the autumnal landscape is breathtaking, proving that Hammond is able to capture the majesty of any country he visits. Read on for our exclusive interview with the young photographer to learn more about what inspires him and what’s next. What first interested you in travel photography? I first became interested in travel photography whilst living and working in China. Myself and my partner took every opportunity to explore China on our days off and so I bought a camera and tried to capture China as best I could. Though your travel brings you many places, you seem especially enamored with Asia. Why is that? I guess I just feel at home in Asia. I lived in China for a year and my first trip abroad without my parents was a trip through Thailand, Laos, Cambodia, and Vietnam. I love the visible difference in culture as you travel between Asian countries and of course, the food. Where did your love of travel come from? My love for travel definitely came from my Dad, who always told stories of his travels and encouraged me to go and see the world. He came to visit me whilst living in China and we took a two-week trip through Tibetan China which was one of the best trips to date. As a travel photographer, what do you try to capture in each location where you shoot? I try to capture the beauty of each place I visit and aim to tell a story through the photos. I love going to remote places that aren’t on the tourist path and portraying the place and the local people in my photos. I always try to use light and color in each location to encourage people to travel more. What do you hope to convey through your color choices? I try to capture an almost fairytale atmosphere in my photos and to show that the world is a colorful place. So many people get stuck in the socially-normal routine and forget that there are beautiful things to be seen all around the world. It doesn’t have to be halfway across the world, it can be on your own front door. I hope that my use of color helps to show this. A lot of photographers these days focus on a desaturated, moody look to their photos, so I tried something that would be a little different. What was your favorite place to shoot? My favorite place to shoot has to be around Mt. Fuji in Japan. 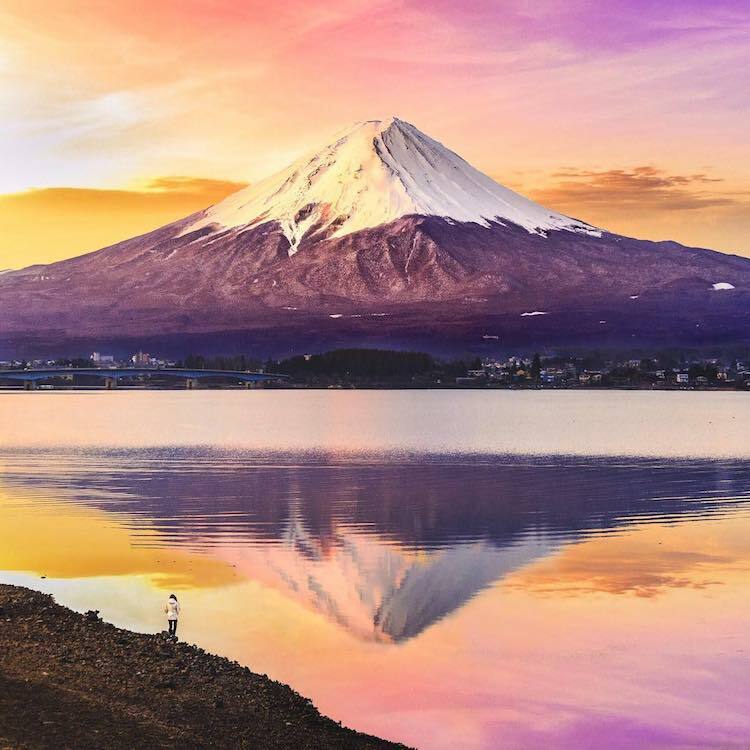 Fuji is one of those places that you have seen a hundred photos of, but nothing can prepare you for actually being there and seeing just how huge it really is in person. We spent sunrise one morning on the lake of Kawaguchiko, watching the local fishermen boating out on the lake and without another tourist in sight. It made me wonder whether the fishermen realized how incredible their surroundings were. What’s the next destination on your list and what are you most looking forward to capturing there? My next destination is Dubai in the New Year. I’ve been to Dubai numerous times as my brother lives out there, but I’m really hoping to capture the low fog and the top of the skyscrapers which only happens a handful of times a year. What do you find yourself shooting with most often? It completely depends on where I am, but I am most drawn to shooting light-orientated landscapes. That being said, I also really enjoy shooting cities and street photography is beginning to shape the way I take photos. Where do you see your photography going in the next 5 years? I’m hoping to be able to move away from Instagram and start up photography tours, particularly in China. China is such a beautiful, vast and interesting country and it’s a shame to see that many people think only about smog and huge, dirty cities. I’d love to be able to change the perception people have of China. I’ll be heading back to China in the Spring next year to begin working on a book which will hopefully open up people’s mindset on traveling to China. Watch this space! My Modern Met granted permission to use photos by Jordan Hammond. The post Interview: Beautifully Colorful Scenes Captured on a Voyage Around the World appeared first on My Modern Met.